Thank you for visiting the Cornell Cooperative Extension Eelgrass Program website. We are excited to reach out to those people who are interested in what is happening in their local waters, and what they can do to help. 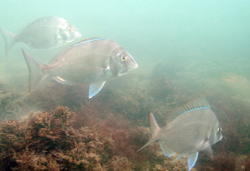 The Cornell Marine Program includes the restoration, management, research and education of many of our local marine resources here on Long Island. 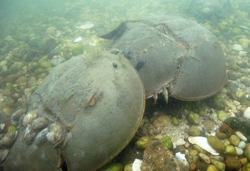 The Habitat Restoration and Monitoring Division involves work with shellfish, finfish and crustaceans and their habitats including seagrass meadows, beaches, flats and saltmarshes. Programs include monitoring, assessment and restoration at all levels. The main purpose of the CCE Eelgrass Program is to restore eelgrass, our dominant local seagrass. This species has declined dramatically over the past 75 years due to many reasons, and unfortunately without our help, it will not likely make a comeback in the near future. Although water quality has stabilized, if not improved in many areas around Long Island, there are no ready sources of propagules (seeds or adult shoots) to naturally vegetate these areas. This situation is called propagule limitation and it is the basis for our restoration work. To track the extent and health of (monitor) existing eelgrass meadows as well as the historic distribution of meadows throughout Long Island. To conduct proactive restoration at appropriate sites around Long Island. To develop alternative sources of eelgrass planting propagules including seeds, transplants and nursery grown material. 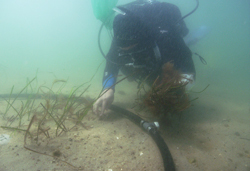 To develop innovative planting methods to restore eelgrass using both seeds and transplants. 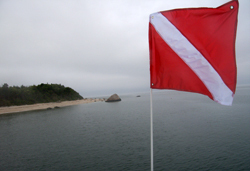 To conduct a limited amount of applied research on eelgrass ecology and restoration.